1} Baptism. This was a special moment for us. We baptized Avery at our church and took vows as parents and members of the congregation to nurture her into a relationship with Christ. 2} Girl's Weekend. Got to spend a fun-filled girl's weekend with some BFF's from college in OKC. Unfortunately this only happens one, maybe two times a year. I sure do love these girls. We went to the movies, ate at great restaurants, did some outlet shopping, had a fun game/wine night in, and of course participated in lots of sharing and laughing! Can't wait to see what kind of girl's weekend 2013 brings us. 3} For Sale. We listed our tiny, Brookside charmer in March. Looking at these pics makes me miss our first house. The neighborhood was quaint, located near Riverside and walking distance from great restaurants. The trees were abundant. It was the house we lived in when Avery was born, and it will always be special because of that. It was listed under 100 days before it sold in July. 4} Growing Girl. I can't believe all of the growing/changing Avery has done in the last year! I'm definitely grateful for beautiful photos like this one (taken by my friend, Lori) that helps me hold onto all those precious memories. We spent a beautiful April afternoon with Lori and my sister at the Dallas Botanical Gardens, and left with some amazing photographs. 5} Church. Our beloved church acquired its own property in the summer after being a thriving church-plant for six years. We wish we could have contributed more blood, sweat, and tears to the property than we were able to because of our own renovations at home, but it has been amazing to see the place turned around. A place our church family can call home. We had our first worship service there the week before Christmas and we cherish this place. 6} One. These are just one of the many "One Year" photographs my dear friend, Shari, took of Avery to commemorate her 1st birthday. "How big are you? Soooooooo biiiiiig!!!" What a fun summer! 7} Pilgrimage. Taylor lost his granddad in February. The entire family gathered in June from all over the states to make a trip to Northwest Oklahoma to spread his ashes in their family plot. We made an entire day trip out of it and saw many of the old family houses, including this one where four generations of my husband's family are pictured together. 8} Homestead. On that very same trip, we saw the family's original farmhouse built circa 1900 on the piece of land that Taylor's great-great- grandfather acquired during the land run. It was an amazing experience, as most of the grandkids had never seen it. I have aspirations to frame some of the photos I took on this trip, as well as copies of originals, to hang in our home. 9} Walking. Avery started walking this year, which was just one of the many firsts that took place in 2012. First swim in the pool, first time to feed herself, first halloween costume, first busted lip, first words, first time to get sick.... The list goes on. Yet another reason I'm so click- happy with the camera. These pictures help me remember all that has happened! I don't have the best memory, you see. 10} Moving Day. Longest. Day. Of. Life. It started as a bright, beautiful day. It ended at 2 a.m. the next morning with mommy and daddy crawling into bed wanting to sleep for days and never wanting to move again. Ever. Although the move was awful, it was monumental nonetheless. I thought it would be hard to say goodbye to our first home, but it wasn't. We had lived so happily in that teeny house, had grown out of it, and had found the perfect place to move onto. Where I had expected tears and longing stares, I found so much joy and anticipation in getting into our forever-kind-of-home. So I guess all in all, it was a pretty positive experience. But, I'm not moving again. Ever. 11} The New Haven Home. We had always loved this house. Amazingly, it was for sale at the same time ours was. It sold several weeks before our home sold and we were disappointed. However, it went back on the market the week before our house sold, and low and behold everything worked out:) We are this home's third, proud owners. Taylor and his family knows the family who built the house, as well as the family who lived in it before we did. It's so neat to know the history and the love this house has been home to since it was built in the 50's- another reason we are so excited to settle and grow our family here. 12} Home Improvement. A new home has meant TONS of home improvements. We have loved making this house our own. And it all started with our kitchen the day we closed. To me, this picture symbolizes all of the hard work we've put into our house since September (although we didn't actually paint the cabinets ourselves). It serves as a great reminder of how far we've come. 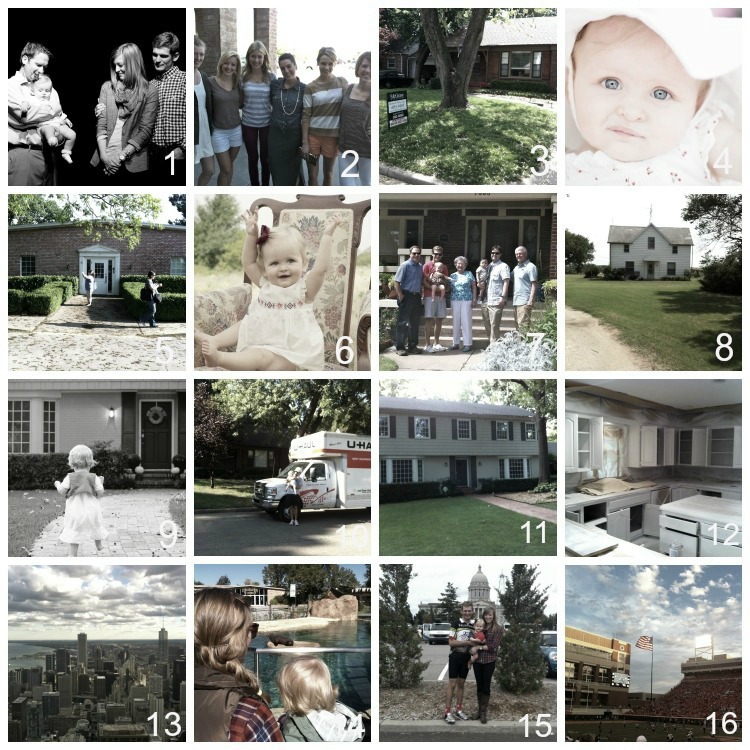 When I find myself being picky about our house and becoming discontent, I think of where we started and how much fun we've had in the process. 13} Chicago. I was incredibly blessed to be able to jet-set to Chicago one September weekend with some girlfriends. It was such a great little vacation after the stress of the move. It's such a wonderful city. Doesn't hurt to be there with people you love:) More about that trip here. 14} The Zoo! Another first for Avery and I this year was the zoo. Taylor surprised us one day in October by taking the day off of work to take us to the zoo! Avery didn't have nearly as much fun seeing the animals as we did. She was more interested in the kids and the toys the animals were playing with in the cages, but oh well. 15} MS 150. Taylor participated in the MS 150 bike ride for the second year in a row. It is a two-day 150 mile bike ride from Tulsa to OKC that raises money for Multiple Sclerosis research. The cause is close to our heart as we have family and friends who are burdened with the disease. Taylor also really enjoys it, as he rides with some buddies, eats tons of free food, and ends the race at the capitol building. 16} Stillwater. As always, we spent a good chunk of time in Stillwater cheering on the Pokes this fall. We share a box with Taylor's parents and family friends. The Cowboys weren't spectacular or anything this year, but that's really not what it's about for us. We cherish the time we spend with Taylor's parents, seeing our friends at tailgates, and being back in Stillwater in general. It's a very special place to us.